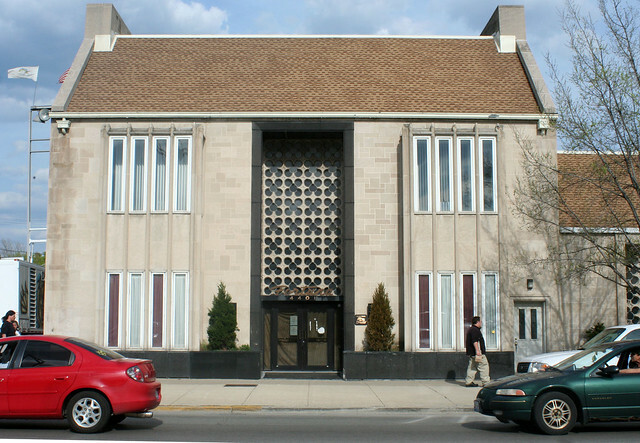 For some fifty-odd years, this lovely 1960s structure was the home of Fortuna Brothers Funeral Home, at 4401 S. Kedzie. 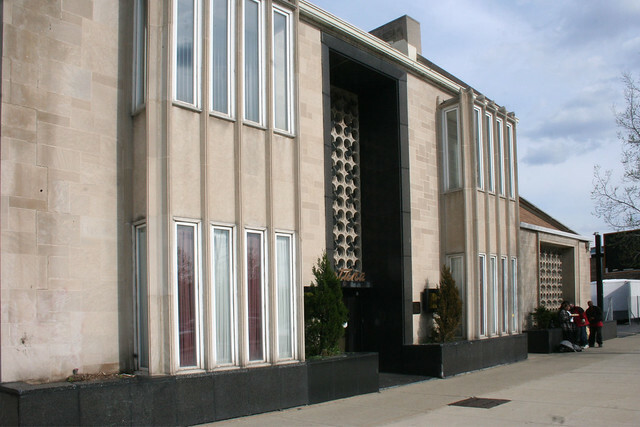 Begun in 1946 by brothers John J. and Stanley P. Fortuna, the site also included their home (a later addition to the rear may have replaced this). Stanley died young at age 46 in 1956, and John passed away in 1969; but the family business continued on for many decades. Death notices at the address first appear in the Tribune in 1952 and are prolific from then on, continuing until 2007. The building went up for sale in 2008. It’s not just that they took a unified, handsome vintage design and obliterated it. It’s that the result is so incredibly bad. 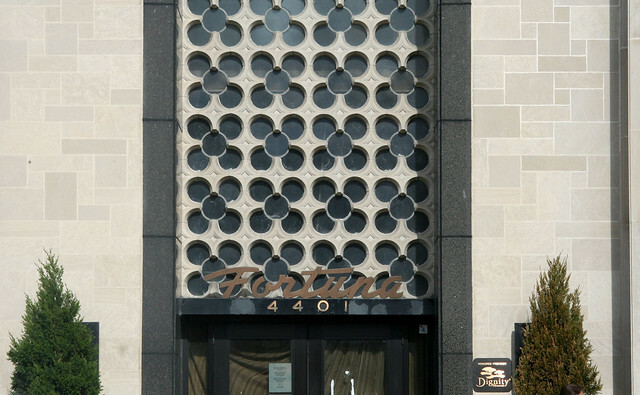 The Fortuna Funeral Home building was built to the highest standards of its time, and some 50 years later, it still looked great. Against this high standard have now been set the cheapest, most low-quality materials possible: Vinyl siding butted up against vintage cut limestone. Fake shutters for the tiny windows (which replaced much more generous ones). An asphalt shingle skirt masquerading as a mansard roof – without even the most perfunctory attempt to make it look like a “roof”. A single tiny vent floating dead center on the facade, as if it were the most important design element – replacing the concrete block pattern window which was the most important design element. At the ground floor, split concrete block has replaced polished granite, and at-grade flower beds have replaced integral planters. It’s impossible to know how much was covered up and how much was removed, but at very least, the building’s original base, and original window configuration, have been destroyed – gone forever. This hatchet job cannot be easily undone. I can’t fathom the thought process. Was this intended to make the place look more inviting, more homely? It fails miserably. Was it a cheap way around costly repairs? Nothing on the original facade indicates any problems. 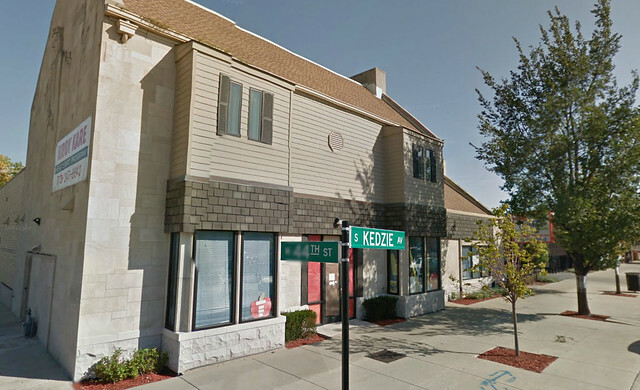 Was it meant to make the former funeral home look less like a funeral home? In this it succeeds, but only because now it looks like cheap junk. At any rate, I would have suggested two alternatives: accept the building as it is (nothing about it really screams “funeral parlor”), or find another building. All the rest is either buried for now, or gone forever. This entry was posted in Midcentury Modernism. Bookmark the permalink. What a mess! 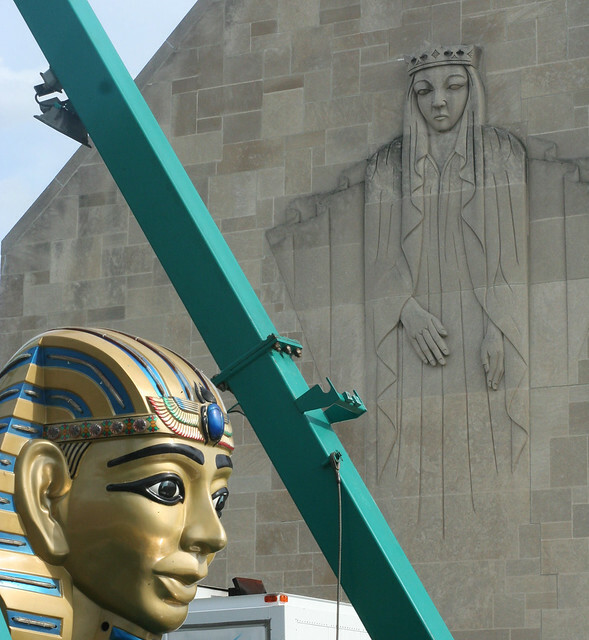 Even Mary looks pissed off. Thanks for this. Youch. What a shame, but my suspicion is that, until around 1990, you’d find few people willing to step up and defend any mid-Century Modern architecture, because back at that point it was totally out of step with either middle or highbrow tastes. These days, it depends. Sad to say, I can’t help but think that, yes, this facade was gussied up to look “more homely, more inviting” because to many southsiders seeking to escape the inner city, vinyl-siding and fake shutters represents an idealized comfy suburbia. Or at least that’s what Kiddie Kare Daycare thinks its clientele is looking for. A “benefit-of-the-doubt” thought: Maybe after the sale, some structural/weatherproofing issues with the windows and concrete were discovered and the new owners did what their budget allowed (i.e. crap). Sock it to ’em R.P. I truly beleive Americans have a real fear of beauty. My mother sided her lovely Victorian era farm house in vinyl (beige, of course). I beilive she is afraid of anything that is even vaguely unique. She grew up in the McCarthy era and is terribly suspisious of anything that is not like everythjing else. Sigh. The building represented the vision of my aunt (Dora Fortuna) and her husband Stanley. When they married in the 1930s, the Fortuna Funeral Chapel was located a block from Five Holy Martyrs Church, on Sacramento and 43rd (the brick building and four-bay garage for the hearses are still there). The new building was a post-WWII project. After Stanley died in 1956, Dora chose to retain “Brothers” in the name of the business that she salvaged. She was able to pay off a heavy mortgage, and through her efforts Fortuna’s became a neighborhood institution from the mid-1950s onward. Dora never remarried. She lived her entire life in the beautiful open plan apartment on the second floor, which was designed for her and Stanley. It is located above the entry hall and office on Kedzie (in your top photo, the door on the right opens on to the stairway, and you can just make out the spandrel at the edge of the apartment floor). The one-story chapels and morgue were always at the back. A casket showroom was built in the side parking lot during the late 1960s or early 1970s. As Dora aged, so did the building. When she died in 1992, the steel roof was leaking badly and in need of replacement. The executor of her estate sold the building on behalf of multiple family legatees. The best offer came from a corporation that kept the business going for a few years, but the building’s maintenance must have been problematic. Even in your “before” photos, the beautiful herculite glass doors with gold leaf insignia have been replaced, along with the casement windows that were operable upstairs and in the office. A feeling that the neighborhood could no longer support the business may have led to the building’s resale. I think you are wrong about the limestone. More likely it is something something called “architectural stone” — a gray terra cotta which could be pressed into a mold and, when baked, would pass as stone. Its use was relatively common in the early 20th century and would explain Mary.